The latest of our NI Year of Food and Drink interviews is with Limavady family based rapeseed oil producers, Broighter Gold. Broighter Gold is owned by Richard & Leona Kane, who discovered the rapeseed oil by accident one evening 10 years ago when they ran out of olive oil while making the evening tea. Read on as Leona talks a little bit more about Broighter Gold below. 1. With over 100 years as a family run farm, how important is it to continue Broighter Gold as a family business? Richard is a sixth generation farmer on the land, we think that it is important to keep the farm in good stand like it has been in since 1853 when the Kane’s first came to Myroe. Jacob (7 years) our son is the last Kane, and who knows if he will continue the farming traditions, it will be completely up to him and we wouldn’t put any pressure on his ambitions. We will of course welcome our daughter Emily into the farm if she wishes to pursue a career in farming, as it’s not that surprising to see girls working the land now! 2. 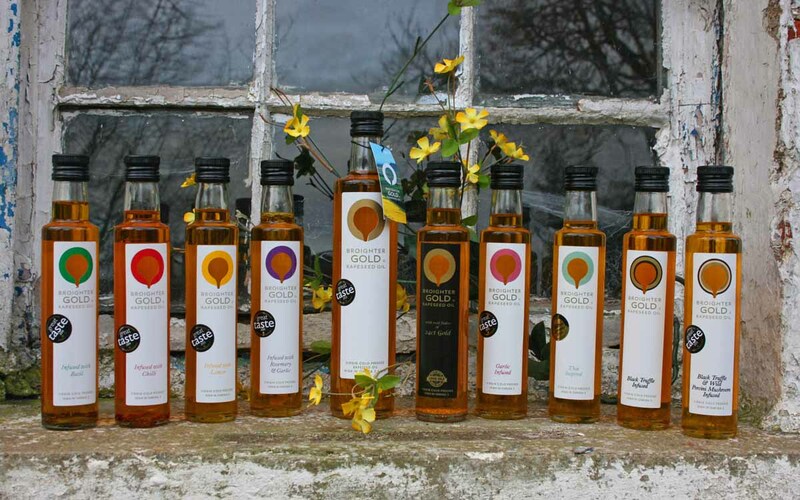 2016 sees you celebrate 5 years of Broighter Gold Rapeseed Oil. Is there any stage during these 5 years that really stands out, and at what point did you realise you were sitting on something special? To be honest every year stands out in our 5 years of trading. We have had such a busy few years with launching our brand and growing a good, reputable company that our customers have grown to love and trust. We love what we do and will continue to do our best. 3. How important is it for you to mix both modern and traditional techniques when producing Broighter Gold Rapeseed Oil? We know our land, and know what it likes and doesn’t! We have experimented with new techniques from Richard’s father’s time, and no longer plough our ground – this has worked really well for the whole farm, and we can see greater advantages to all of our crops. 4. What makes the location of Broglasco Farm, Limavady ideal for growing the rapeseed that is used to make the famous Broighter Gold? We are very fortunate that it is one type of soil, due to it being reclaimed some time ago. We have a unique soil and AFBI confirmed that it is unique to the whole of NI some years ago. Its like a wine it depends the variety of seed and also your soil type to ensure you get a good end product. 5. You have won many prestigious awards for Broighter Gold over the last 5 years but is there any in particular that really stands out as a highlight of your journey so far? I get asked this all the time! Each award is different and we truly appreciate each one we receive for different aspects of our business. It is such a hard area and there are so many fabulous food producers and small businesses now, its always a very tough competition. 6. Have you a favourite recipe using rapeseed oil? I love eating fish… one I do a lot for a family meal – Rainbow Trout cooked in the lemon infused oil. Add some fine noodles with lots of veg tossed through – Thai inspired. For the kids I would normally do them a few wedges in a basil oil with fresh greens. It’s simple, quick and handy when you have been working all day. 7. 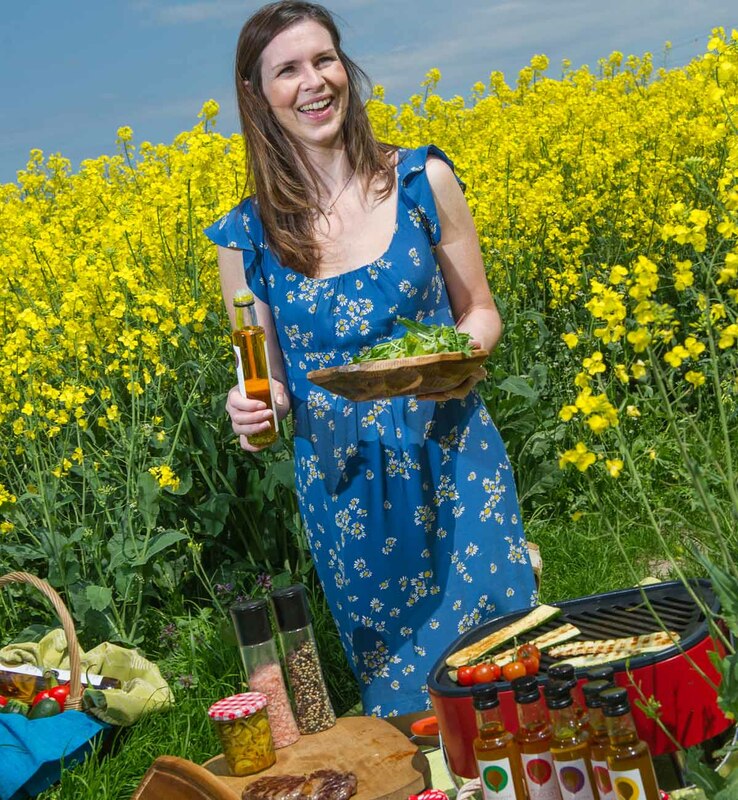 How important have local NI markets and restaurants been in helping to build awareness around Broighter Gold Rapeseed Oil over the last 5 years? That’s how we started and we still do a lot of markets and fairs. This not only raises awareness for our products but also lets us meet our customers face to face. 8. With 2016 being the year of food and drink here in Northern Ireland, how important is it for consumers in Northern Ireland to support local food producers like yourselves? We already have so much support from our customers, obviously the more awareness we can get for all NI products to be used daily in the household, is good for Northern Ireland as a whole, as this puts money back into the community and farmers. It also creates jobs in the area, and keeps the money in an area which can only be a benefit for the whole place. 9. How important is it for you to continually look at new flavour combinations to add to the Broighter Gold product range? You never stop as a food producer, trying new things and thinking of new creations. I only ever create new products that I actually like myself. If I don’t like them, how would I expect anyone else too! I love cooking so it comes easy and seeing what the new trends are for cooking and baking is always interesting. 10. Many famous faces have enjoyed Broighter Gold through the years. Who are you most proud to have tasted your product? Yeah, Noel McMeel served it up to the G8 at Lough Erne. We have had a long line of chefs, from James Martin commenting “mmm nice” at BBC Good Food show, to Simon Rimmer and William Sitwell; so many too mention to be honest. Hardeep Sing was the most interesting person I met. He had such a knowledge on rapeseed and all the different varieties available. We had a long geeky talk about it – great fun! It’s great to have the celebs taste it but it’s more important to have our customers buying it – they are the important ones to get the taste right for. We’d like to thank Leona for taking time to answer our questions and give us a little insight into the Broighter Gold world. You can find out more about the Borighter Gold Rapeseed Oil by visiting www.broightergold.co.uk or following them on Twitter (@broightergold) and Facebook. We’re planning a series of interviews with local food & drinks producers, restaurants and foodies as we celebrate an important year of food and drink here in Northern Ireland. Get in touch if you would like to get involved. Keep up to date with all the latest news here at Pikalily by signing up to our newsletter or following us on Facebook and Twitter.